plesiomorphic: This state of a character is the primitive or common ancestor state. apomorphic: This character replaces the plesiomorphic form with a derived form , which is usually specialised as in the disparate claws. 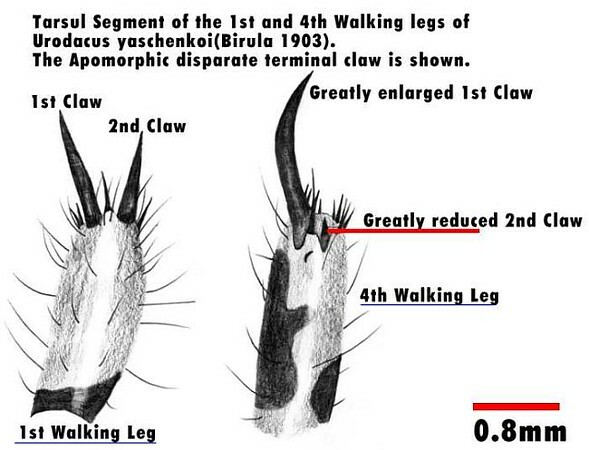 The diagram right shows a sketch of the tarsal segments of the first and fourth walking legs - note the disparity in the length of the terminal claws as shown. The third and second walking legs (not shown) also show a reduction of the second claw, although not to the same extent as the fourth. In fact there is a gradual reduction in the length of one claw from the 1st to 4th leg with the other claw increasing in length. This development has come about as a result of Australia's drying out, creating a vast sandy environment, now very successfully inhabited by this and other similar species. The common ancestor of the genus Urodacus would have more than likely evolved in a mesic, temperate environment. Such species as Urodacus manicatus show mesic adaptation and may well be very close morphologically to the common ancestor of Urodacus, and therefore not surprisingly display minimal if any apomorphic characters in this genus. As Australia dried out various new environments started to arise and the resulting speciation as we see it today would have begun in earnest. Those animals such as U. yaschenkoi have managed to evolve the necessary features to survive in the current xeric environment, a far cry from the temperate rainforest once covering much of Australia. The terminal claws as shown have evolved to give the animal increased traction in a very loose sandy environment. Urodacus spp that dig in hard compacted soil do not display the disparate claw lengths as shown, but have maintained the basal plesiomorphic character state of the presumed common ancestor. Such apomorphies arise out of environmental selection pressures. U. yaschenkoi is at the extreme end with respect to apomorphies, having evolved to cope with xeric conditions. Various intermediate forms of arid and xeric adapted Urodacus have evolved across Australia, all exhibiting similar apomorphies at various levels.